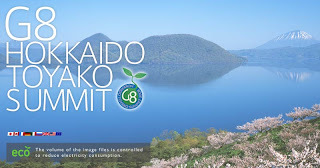 Traveling in Hokkaido I could not resist paying a brief visit to the where only one month ago this year's G8 summit took place, the area around lake 洞爺 Touya. G8 stands for "Group Of Eight" and was supposed to represent the eight mightiest industrial nations on this world. 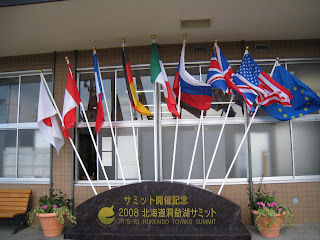 They are USA, Japan, Germany, Great Britain, France, Canada, Italy and Russia. In addition to that a representative of the EU takes part. 13% of the world's population are living in these eight countries, they receive 65% of the world's national income, and control 45% of the world trade and more than 70% of the world's military spendings. They also represent 80% of the world's biggest companies, and hist the eight mightiest banking institutes. The G8 is like an exclusive club, invitations to other nations depend on the decisions of the eight members. Also like a club the meetings are informal, unlike a legislative meeting. One of the eight members takes president ship over the club for one year and is supposed to organize a summit in this year. This year the president ship lies in the hands of Fukuda, Prime Minister of Japan. Most people I met don't understand why people protest against the G8 club, since in the news they hear that on the summits important topics like reduction of climate gases or reduction of poverty in Africa are discussed. 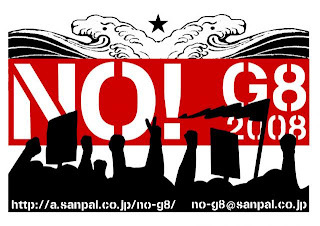 That is why I want to give 8 reasons why people protest against the G8. Yes this seems contradictory to "reduction of poverty" being always a topic of the summits, but in fact little is done to change the conditions. The biggest source of the poverty (next to corruption, which is harder to tackle) are the debts of third world country towards the G8. However despite the talking about "reducing poverty" not much of this debt has been canceled. And in fact most of the "Development Aid Funds" paid by the G8 countries end up being used to pay the interest on those debts to the world bank and thus flow back into the G8 countries. One of the high priority goals of the G8 is to get hold on resources. If other options fail, resources have to be secured by war. One example is the infamous "War On Terror", which is also a topic of G8 summits, but leads only to destruction, poverty and civil unrest. 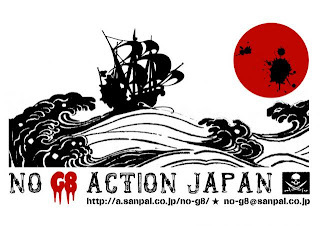 Another proof is that 90% of the world's weapons are exported from the G8 countries. The spendings on weapons in 2007 were 700 billion dollars, where in comparison 350 billion dollars would be enough to counter poverty world wide. Again this stands in dispute to the topic of the G8 summits being "climate gas reduction" and "counter measures to global warming". Still the eight countries account for 45% of the world's climate gases. And despite of the talks about reduction of the last three G8 summits, no fixed numbers, no obligations, basically nothing but the general agreement that something needs to be done, has been decided. While another topic of the summits is how to fight the spread of Aids in third world countries, all that is done about it is to give some money to corrupt governments. However even that money that is actually used on fighting Aids, is spent on Aids medicaments coming out of the G8 countries and thus furthering the local economies. For a long time African countries try to make clear to the G8 that instead of money, they need the right to produce Aids medication themselves. However the G8 are unwilling to grant this rights, which would prevent the money spent on fighting Aids flowing into the local economy, where the medication is produced and protected by patents. It has always been an interest of the G8 countries to further privatization of areas like for example: health, education, and pension. With this receiving one of these services becomes dependent of your wallet and poor people are prevented from having the same health, education etc. than richer do. The G8 states have an interest in furthering profits of their economies. One of the methods they use is to play of people in one country against the people of another, to force them to work longer and harder for less wages and benefits. For that for example European members decided on a service policy, which includes these goals. One of the fruits of the G8 policies are a high number of refugees all over the world. There are more than 40 million refugees on this world. Many of these people long for the security and safety in the G8 countries. However, in spite of being responsible for the causes, they do not allow refugees to enter and live in their countries and send them back where they had to flee from. While the G8 club only represents 13% of the world population, their politics affect 6 billion people. Another good example for them being undemocratic is that every G8 summit has to be protected with high fences, police and military and a ban on people on a huge area. The summit in Japan this year was no exception. The area of lake Touya was secluded from all people. 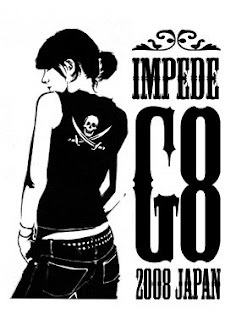 Protesters were only allowed as far away as Sapporo and Ishikari. Only very few demonstrations have been allowed and only under very strict rules, like not more then four people were allowed to walk next to each other. Harsh security checks were found as far away as Osaka and Tokyo, especially at the airports. People being known for being activists like the 74 year old Attac member Susan George was detained at the airport. Japan spent 280 million dollar on the seclusion of lake Touyako for the summit, more than twice of what had been spent last year in Heiligendamm in Germany. However what I disliked most about the way the police handled the summit security were these posters, which you could see all over Japan. They tell all Japanese citizens to keep an eye on suspicious people, which might go to the summit and report them to the police. With this move every foreigner has become a potential suspect, and every citizen a potential police informant. So they played the people off against each other in a really dirty and mean way. 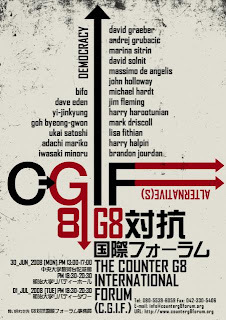 Also because with this poster they basically told the Japanese citizens, which don't know much about the G8, that all people who protest against it, are terrorists. Now what the protesters do has little to do with terrorism. This year they met in 80 events during the summit period and talked about how to really reduce poverty (release the debts), how to really fight Aids (allow governments to produce Aids medication) and how to further world peace (reduce spendings on weapons), which's results they would then present to their countries leaders. For Japan which is not used to civil protests, the summit protests events have been a full success with 5000 - 10.000 people attending, and the Japanese news covering the protest events surprisingly well. When I visited lake Touya and watched at the Windsor hotel far off in the mountains one month later, not much was left of the turbulent time. Still you could find flags and signs everywhere, welcoming the representatives in Touya and warning people of entering the secluded summit area. Also curiously enough the driver who too my hitchhike call and took me to here asked me the question: "Do you hate the G8 summit?" and I honestly answered "Yes."